Mystery Reels is a 5-reel, 20-payline slot from Red Tiger Gaming, with a reported 95.19% Return to Player. The mystery icon is your key to big wins, spreading multiple fruit symbols on adjacent reels. There are no free reel spins here, but a Tombola-style Bonus Wheel multiplies potential wins without needing to bet again. Get into this bonus round, spin the wheel, and you have a chance to make serious bank, up to 1000x bet or even more. The gold apple icon or bonus wheel symbols start the real (reel!) fun. Try out this fun slot at a recommended casino! In Mystery Reels, you can set your wager amount by clicking on the Bet button at lower left. Choose an amount from £0.20 to £20. You can choose an Autospin option and just let it ride up from 10 up to 100 spins, or set loss limits. Otherwise click the gold Spin button on the right and hope for the best! The game has no wilds in the usual sense, but the multiplication of matched symbols (“clones”) and their projection onto the reels by the gold, mystery apple icon can vastly increase your winning potential. 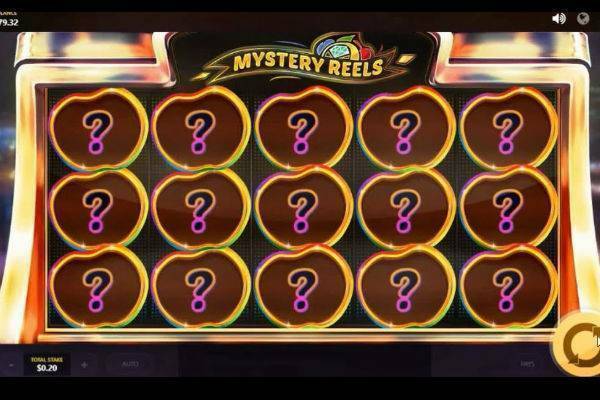 In terms of its fixed jackpot, Mystery Reels offers a prize worth 900x your bet, which can be won if you spin 5 of the Number 7 symbols. However, what’s more interesting is that this slot has an exciting Bonus Wheel feature offering multiplied prizes up to 1000x bet on a single spin. Together with additions and multiplier options, that figure increases to a very impressive 5000x! 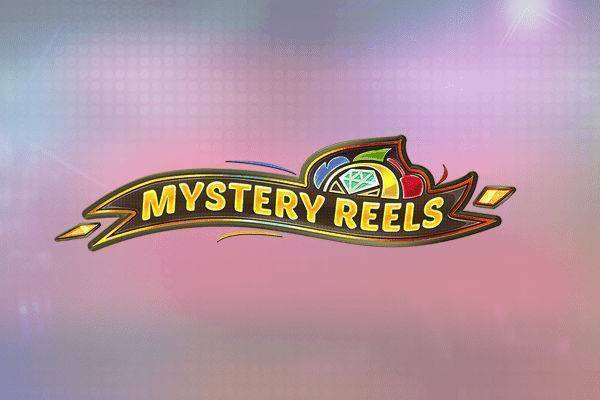 Mystery Reels has some pretty exciting surprises up its sleeve, which both deliver fun as well as lucrative cash prizes. Mystery Symbol: The apple-shaped icon bearing astounding secrets inside may emerge on any reel and any row. A number will indicate how many matched images will be revealed, and the more the better! This mysterious totem will then then project sets of unique icons, spreading out to the neighboring reels in any direction, vertically or horizontally, like some sort of alien beacon. The result is a cascading explosion of colourful fruit. There are no specified limits to how many identical images may be revealed. You may experience this mysterious event as identical images spreading out across the grid like a fire out of control. The possibilities appear virtually limitless, and the rewards immediate, if the revealed symbols happen to match those already in view. Bonus Wheel: This is a Tombola-style circular spinner. It is triggered by the appearance of one or more Bonus symbols in the regular game. The number of Bonus Symbols determines how many times you can spin the Bonus Wheel. Once inside the bonus game, you don’t need to bet again, and all the prizes are doubled. Bet Multipliers from 2x to 10x total bet. These numbers may be multiplied further if a subsequent spin lands on the Double All wheel wedge. Double All increases the value of all prizes in view by a factor of 2 including any that may already have been awarded as Additional Prizes or Additional Wheel Spins. Additional Wheel Spins of up to 3 more increase your chances to pull in more bonus prizes at no additional risk. Additional to All increases all Bonus Wheel prizes by 5. Mystery Symbol: this apple-shaped image may spin further magic by revealing any of the Bonus Wheel Prizes. This game is nicely and professionally presented, with the various symbols presenting colourfully against a black background, but this video slot will not wow you with its graphics or illustration quality. Most of the symbols are standard for fruit machines – literally, most are fruit. But the game play really gets exciting when the golden Mystery Apple appears and spins its magic, or when the Bonus symbols qualify you for the high-yield, wheel-spinning action. Mystery Reels from Red Tiger Gamin has two outstanding features: the Mystery Apple spawning fruit symbol clones, and the Bonus Wheel where prizes can be multiplied dramatically. For these features alone it’s worth giving this interesting video slot a whirl. The prospect of a multiplier-fueled jackpot of up to 5000x bet gives you thousands of reasons to try this out at one of our recommended casinos!